C72071 - BAE Systems single seat Eurofighter Typhoon replacement cockpit for the Revell kit. Advantages: Improvement in detail over the kit plastic parts; excellent fine casting. Conclusion: These are all nice upgrades to increase the detail of your kits and will look very realistic when fully assembled and painted. 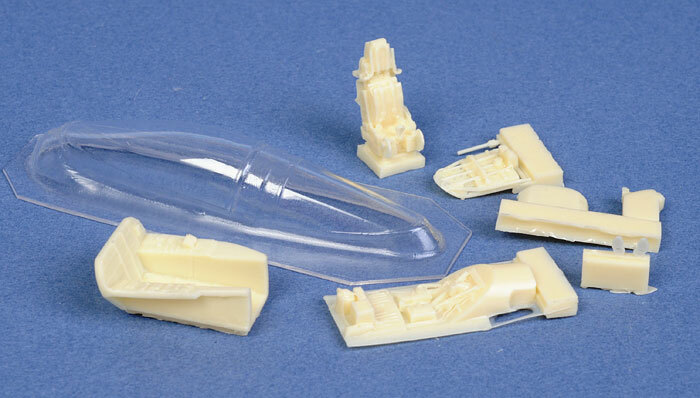 In this review I cover three 1/72 scale cockpits from Pavla for the Eurofighter Typhoon, F-105G Thunderchief Wild Weasel and Mirage F.1C. The cockpits provided in the model kits are of an average standard compared to the detail provided by Pavla in their replacement cockpits. Casting and detail is to a very high standard. The parts have no residual resin flash and are attached to small casting blocks that are easily removed with a fine hobby saw. Assembly is straightforward with very little or no apparent modification required to the kit plastic to allow the new cockpits or fuselage parts to fit. Modellers with very little modelling skills could install these detail sets. The instrument panels, cockpit tubs and ejection seats have some excellent raised and relief detail and a wash and highlighting will add some life to the basic cockpit. The seats have the seat harness moulded onto the seat. 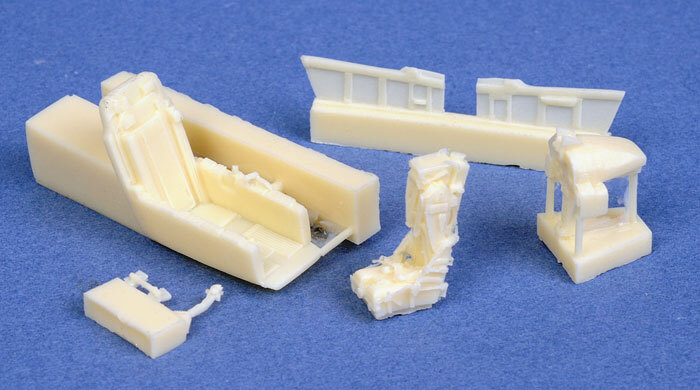 This detail set contains nine resin parts including the ejection seat, cockpit tub, instrument panel, instrument shroud, control column, centre console, canopy deck and rudder pedals. The detail on the seat is crisply moulded with the ejection seat pan handles are perfectly moulded in scale. A replacement vacuum formed canopy is also provided to replace the kit canopy. These are direct replacement parts and no rework of the kit is required. 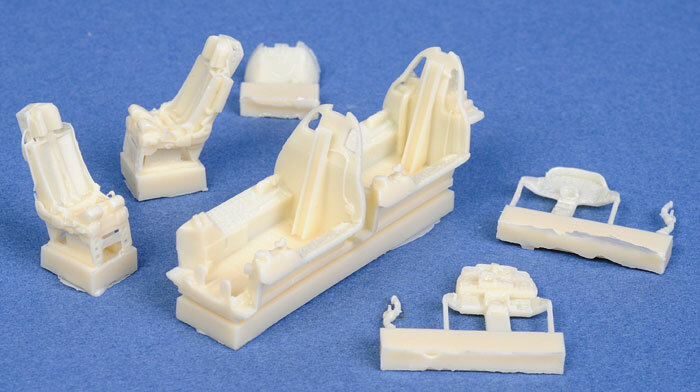 This detail set contains eight resin parts including the ejection seat, cockpit tub, side panels, instrument panel and shroud, control column and rudder pedals. The cockpit tub also contains a replacement nose wheel well incorporated in the moulding. These are direct replacement parts and minimal rework of the kit is required. This detail set contains eight resin parts including two ejection seats, two cockpit tubs, two instrument panels, one instrument shroud and two control columns. These are direct replacement parts and no rework of the kit is required. These are very nice upgrades to increase the cockpit and fuselage detail in the mentioned kits, and will look very realistic when fully assembled and painted.